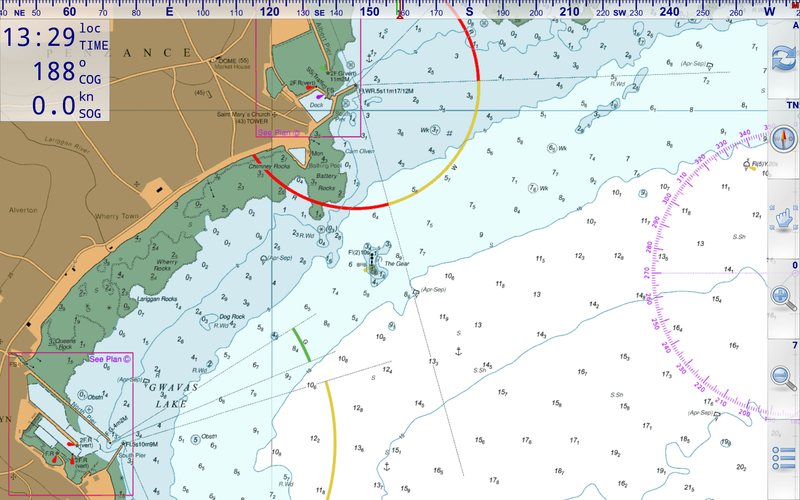 The above screenshot shows the chart outlines in "Marine Navigator"
A new easy chart activation system has been developed for VMH encrypted chartsets with activation codes provided on purchase. Chart purchases / downloads, installation & unlocking are always totally outside of Google Play Store infrastructure for free or paid chartsets. Made from standard raster charts. 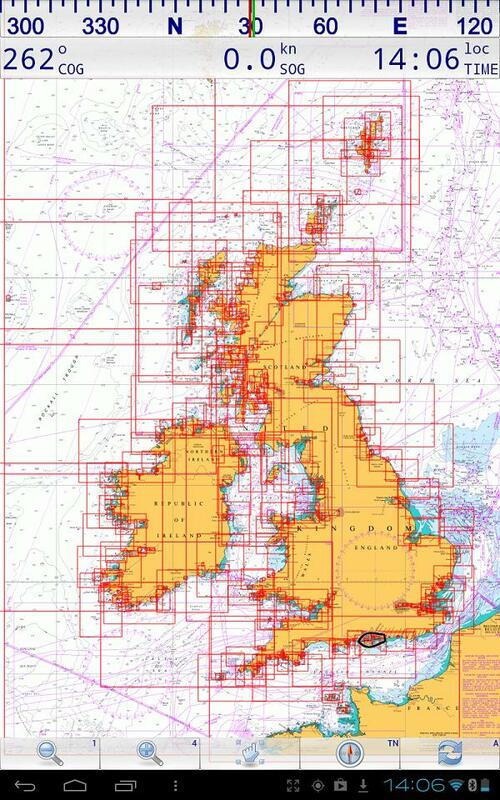 You just can't beat the superb detail of raster charts. 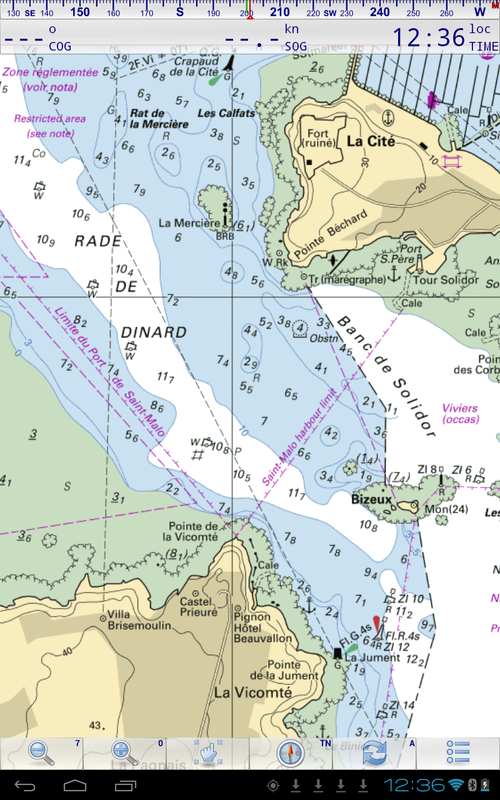 Vector charts do not have the richness of detail, but are seamless. At VMH we prefer raster every time. 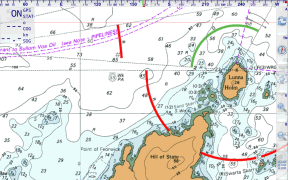 When used with appropriate charts, the app can be used as a stand alone portable chartplotter using the Android tablets' built in GPS (and compass if present). Routes, waypoints and tracks can be used and saved. Charts can be dragged around and switch automatically on zooming in/out. AIS function has just been added with an in app upgrade to ongoing AIS capability. 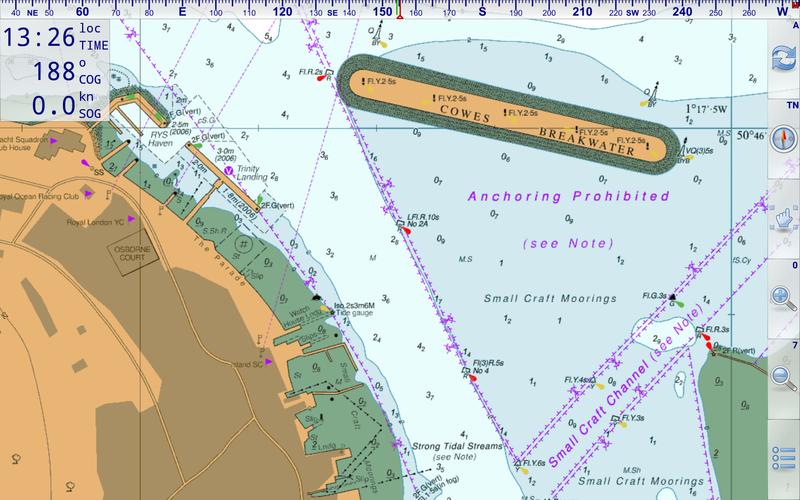 NMEA feed for AIS targets needs to be delivered by wifi network. Small AIS units that provide this are available cheaply, well under £100. Existing users of the app, can update to the "new" version via the Play Store (without charge) to experiment with the AIS function. Existing working VMH chartsets will be unaffected by this app update. Why use an Android tablet ? Because we've found it to be so easy to actually use in real seagoing situations. The designer Ronald Koenig, is responsive and continues to update his app all the time. It's versatile.. In addition to our encrypted charts, it can also use standard BSB2/3 charts you may already have. 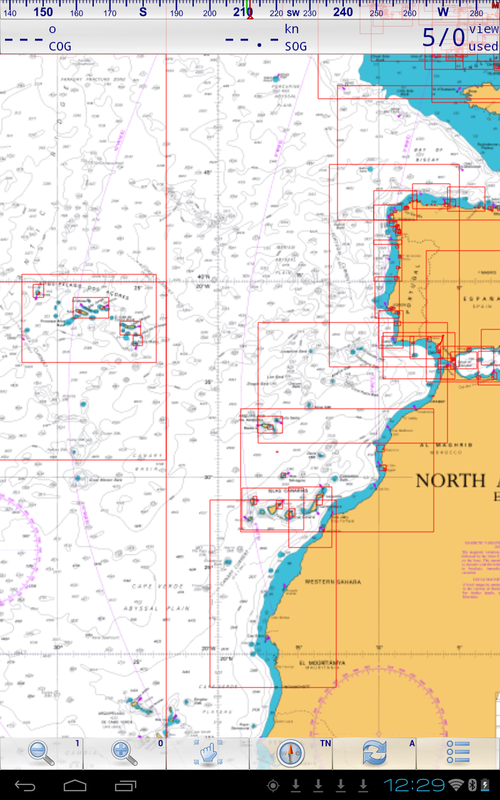 For instance Antares charts for W. Scotland. 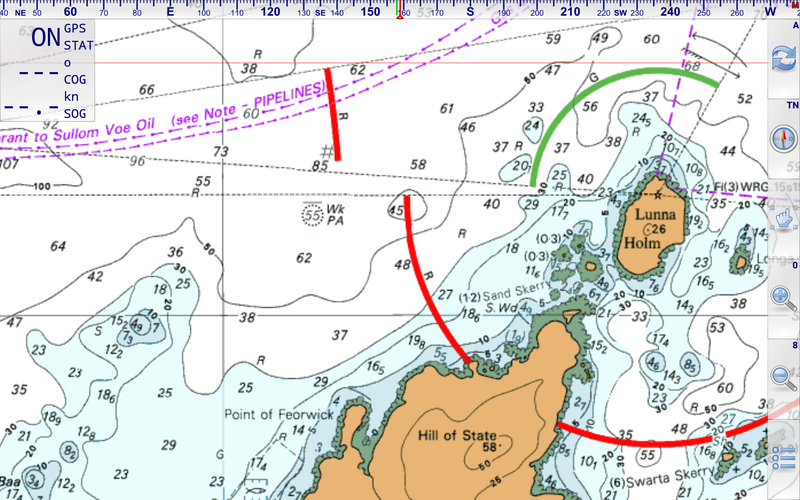 This app can even calculate routes using Great Circle (for ocean sailors) or Rhumb lines. * Man Over Board (MOB) functions"
Our favourite feature so far: Being able to point the tablet at the bows, "Compass Up", and having the "True Course Line" switched on. This show as a dotted line stretching ahead the CMG by the boat. 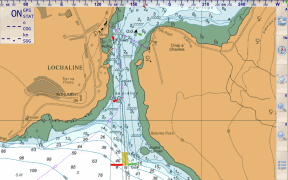 So "at a glance" the navigator can see how much the current is having an effect on the boat at that instant. (Or leeway for that matter). The "Compass Up" feature also allows you to positively identify buoys or seamarks from a distance, by lining them up with the tablet/phone. Note: Not ALL Android devices have a built in compass. In this picture above both vessels have send position reports and static voyage related data (name of vessel, call sign, ...). The black dots show the last received position. 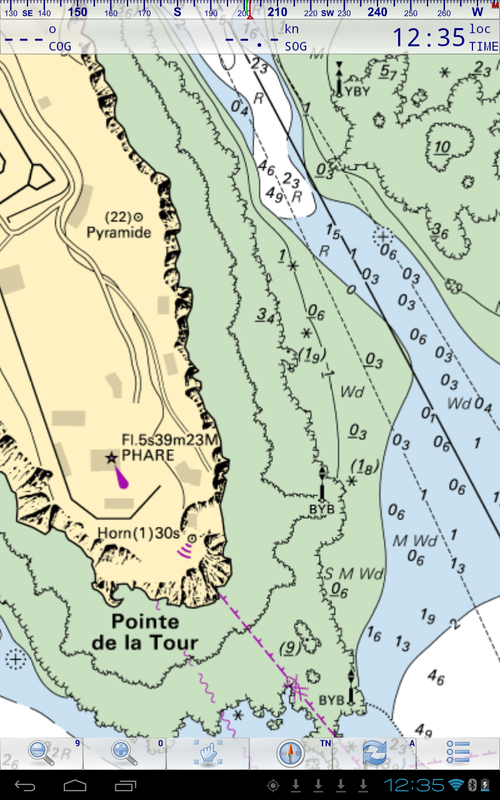 The black lines show the predicted course. 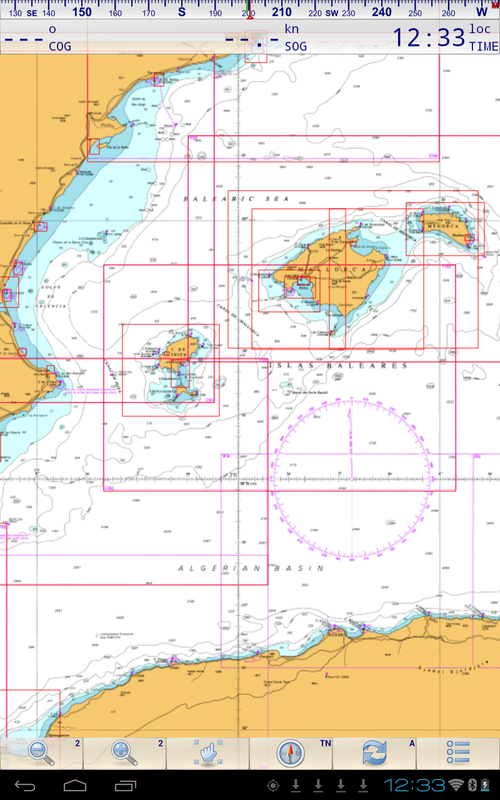 The position of the vessel is calculated based on the data of the last received position report (position, COG, SOG). The dimensions of the vessels are taken from the last received static voyage related data report. Capt. Morgan is selected therefore its detailed data are shown in the upper left corner of the screen and its track based on the previously received position reports is shown by a green trailing line. Capt. Morgan has not specified its destination. Therefore destination information is missing below the call sign. This picture above shows a collision alert. 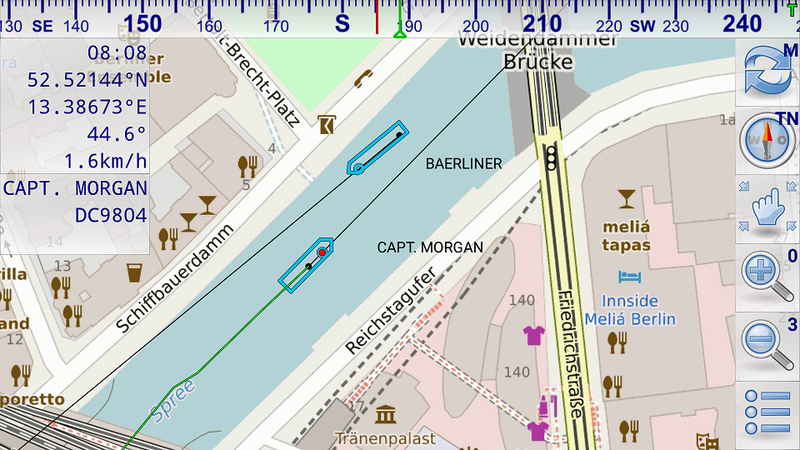 The red line on the own course line shows the passing distance when the other vessel crosses the own course line. 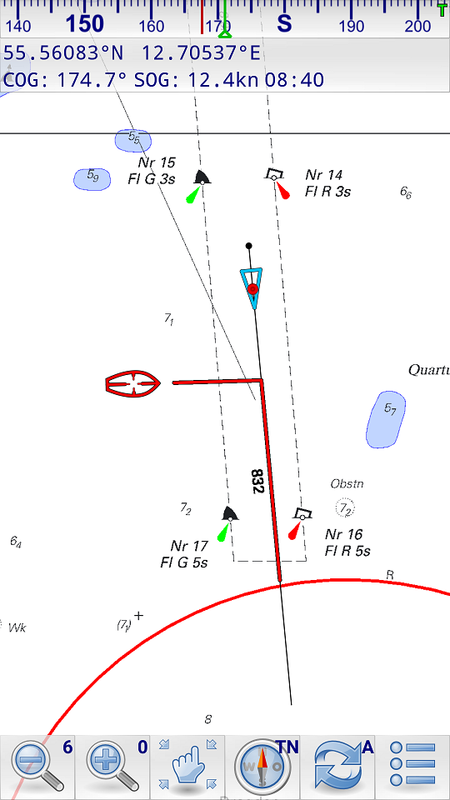 The red line on the course line of the AIS target shows the passing distance when the own vessel crosses the course line of the AIS target. 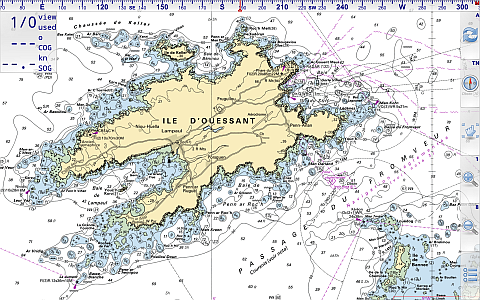 In the illustrated case the own vessel will cross 832m behind the AIS target. 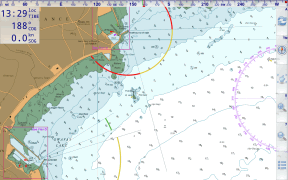 The AIS target (red cursor) is selected. It hasn't send any static voyage related data yet. Therefore only data of the position report is shown (position, SOG, COG).